U.S. Attorney William J. Ihlenfeld II will be Commencement speaker at the West Virginia Northern Community College ceremony scheduled for 7 p.m. Friday, May 10, at WesBanco Arena, Wheeling. 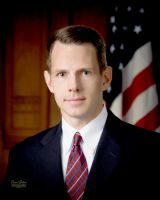 Ihlenfeld, who was sworn in as U.S. attorney for the northern district of West Virginia on Aug. 10, 2010, has devoted his career to public service, having served for 10 years as an assistant prosecuting attorney in Ohio County, and for three years in Brooke County, before assuming his current position. Since becoming United States attorney, Ihlenfeld has focused his attention on the prosecution of drug traffickers, child predators and white collar criminals. He has implemented several new initiatives, including the Mountaineer Highway Interdiction Team, Project POWER, a comprehensive anti-violence strategy, and Project Future, a drug education and enforcement program that has reached more than 8,000 middle and high school students in northern West Virginia. Ihlenfeld has created a public corruption unit within his office and a hotline that feeds information to the unit. He also has successfully led the effort to obtain federal funding from the Office of National Drug Control Policy for drug task forces in the Northern District. He is a graduate of the West Virginia University College of Law and resides in Wheeling with his family.